Learn to tame the fire. I grew up hearing stories from old-timers about the way bread used to be made. The way, in their village in the Alps, you would use a sheaf of wheat to tell whether the brick dome, which a team of men had stoked day and night, had reached the right temperature. Slide the blade in on a wooden paddle and judge by the way it turned russet, if it was time to slip in the loaves. They made bread twice a year. It took three days of feeding the fire day and night to bring the oven up to temperature. But you ended up with crusty, dark loaves. And as the oven cooled, you’d slide in the tartes and the Dutch oven gratin dishes that would cook in the lower temperatures. All of this to say that I believe in the magic of a wood-fired oven. So does Antoine Cantarel, born in Bordeaux, France, who remembers the occasional times they would fire up the communal oven on his grandmother’s farm, where this communal good inhabited a space near the stables. In the old days, he heard, folk would bring their loaves to cook once a week—more if there was a marriage or baptism—leaving behind their contribution of wood for next time. They no longer did, but Cantarel was drawn to the process by passion. Fast forward a number of years and Cantarel founded The Bread Stone Ovens Co. in Dallas in 2011, importing Four Grand Mere ovens based in the Vosges mountains of France. They send ovens around the country and just started offering a regular monthly schedule of hands-on tutorial workshops in both pizza- and bread-making at their facility on Skillman Ave. Eight to 10 people gather around two wood-fired ovens. Some already have a wood-fired oven, some are interested in buying one. Some just want to learn how to make a good levain sourdough bread in their home oven with a pizza stone. Cantarel explains how the beast works – the way you watch for the soot turning from black to white, the bricks from rosy-orange to pink, when the temperature is over 600F. Little details like these he might lace into the classes as people shape the dough, made from organic heirloom wheat flour ground the day before by local Grapevine Grains (yes, the farmers market people with the wonderful granola). 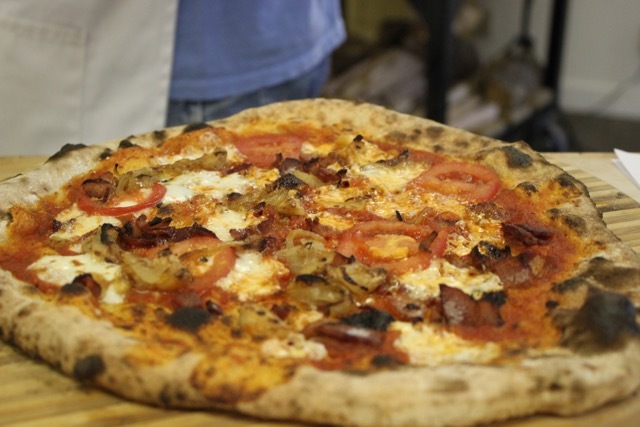 Classes are $125 per person, 9am-1pm for pizza classes, a little longer for bread classes. Pizza classes tend to sell out one month in advance. When last I checked, February’s pizza class was sold out. 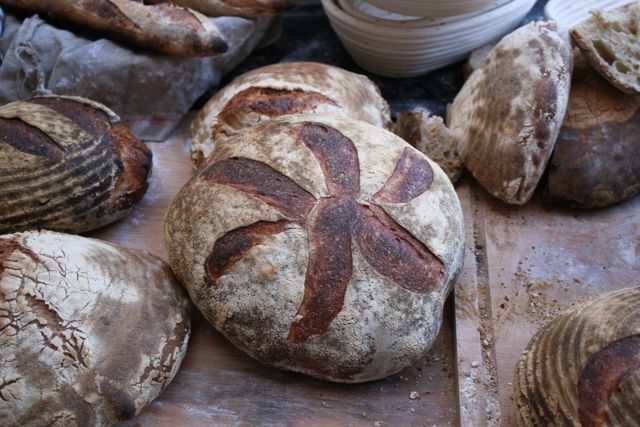 Bread lovers will want to jump on the March bread class—or wait for the next one in fall. Meanwhile, you have a few months to decide whether the idea of wood-fired summer pizza makes you go weak at the knees.